I live about a mile from the sugar white beaches of the Gulf of Mexico..... in Gulf Shores, Alabama. 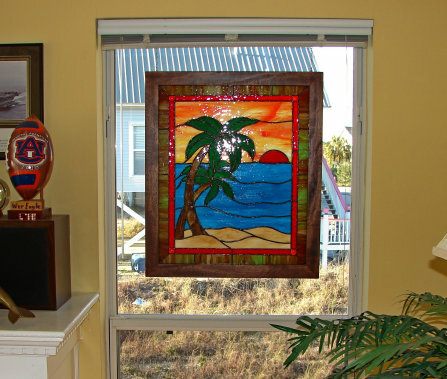 Over the years I have built a number of nautical themed stained glass windows.... boats, dolphins, pelicans, sailboats and so on. I wanted to design a new pattern that had a limited number of pieces and fairly basic cuts, so it would not be overwhelming for a new student. This pattern could be built using just the central beach scene that would have only 52 pieces and measure about 15" x 19". The two outside bands would be optional, and if included, would add 30 pieces and make the final size 20" x 24". The frame was cut from a scrap 2" x 6" piece of mahogany pulled from the dumpster behind a local door manufacturing company. The frame is 1 3/4 " wide and 1 1/4" deep, stained and varnished with a walnut stain. Mahogany is such a great wood to work with and takes stain beautifully. When I finished this design, I knew exactly what to do with the finished piece. I have a good friend of 3 decades who recently helped me with a real estate transaction. His name is Pete Vakakes, a local real estate broker who goes by "Pete on the Beach". 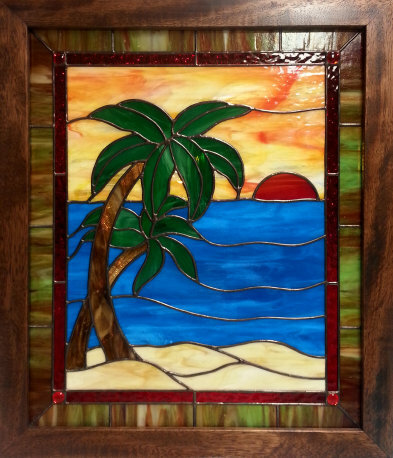 Pete has a beautiful home overlooking the water..... and the perfect place to hang a tropical beach window. In appreciation for his help and his friendship, Pete is now the owner of this window. Pete is one of the nicest people I know.... so I know he will appreciate this window. Pete's Window was completed in November of 2015, contains 82 pieces of glass and measures about 23" x 27" in its mahogany frame. It now hangs in the window of Pete's home in Gulf Shores, Alabama.